Booz Allen Helps Global Accelerator Focused on Social Entrepreneurship Plant Roots in Washington, D.C.
Few entrepreneurs start off with all of the right tools and resources to successfully launch and grow a business idea. Even fewer have the toolkit they need to shape businesses that impact the world. To address this need, SEED SPOT DC and Booz Allen Hamilton have forged a strategic partnership that combines SEED SPOT’s commitment to educate, accelerate, and invest in entrepreneurs creating solutions to social problems with Booz Allen’s century-long history of mentoring young innovators and devising global solutions for clients. SEED SPOT strengthens the local entrepreneurship community by cultivating ventures focused on the greater good through unique incubator programs. The incubator guides entrepreneurs in creating a product, service, or technology that positively impacts the world, from idea to scaling. The organizations SEED SPOT has worked with have collectively created more than 700 new jobs and positively impacted more than 1 million lives. Booz Allen will serve as title sponsor and mentor SEED SPOT entrepreneurs as they build their ideas into functioning solutions. The partnership will launch in April 2017 with a focus on inclusive entrepreneurship, including opportunities for women, minority, and veteran entrepreneurs. SEED SPOT runs a series of programs for social entrepreneurs including 5-day boot camps, 12-week evening programs, and 15-week full-time programs. In partnering with SEED SPOT Booz Allen will take on the role of Innovation Catalyst sponsor and provide entrepreneurs with access to mentors from its diverse employee base. 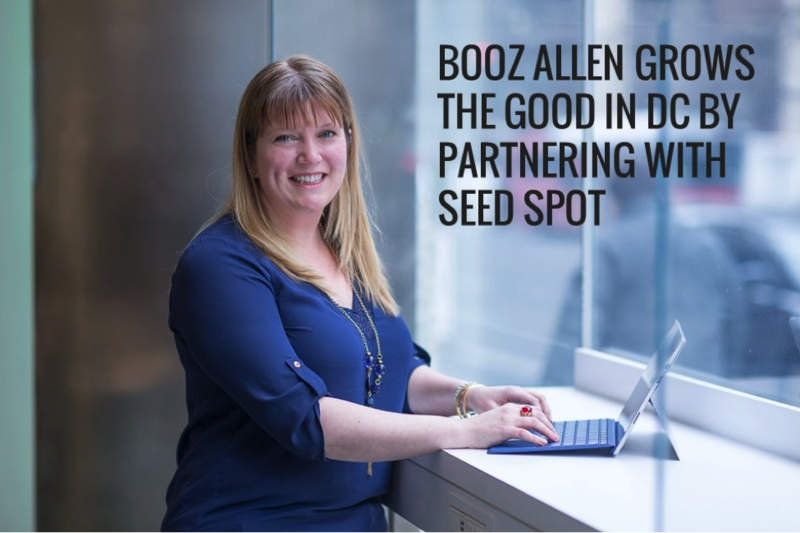 SEED SPOT’s Co-Founder and CEO Courtney Klein will be speaking on a panel at Booz Allen’s annual Ideas Festival to be held in the firm’s DC Innovation Center on January 28. To attend the event, register here. SEED SPOT’s full-time social entrepreneurship program will begin in April 2017. The deadline to apply is March 1. To learn more about the program, go here.